A key tool for geotechnical engineers that work with tunnels, underground excavations, and caverns, UnWedge is used to determine the stability of rock wedges formed by the intersection of structural discontinuities. UnWedge calculates factor of safety and can determine support requirements for projects. Help yourself to a comprehensive database of product support. Subscribe to get free upgrades and expert help for your software. See the latest software updates. Download the latest version of the software. UnWedge is a 3D stability analysis and visualization program for underground excavations in rock containing intersecting structural discontinuities. Safety factors are calculated for potentially unstable wedges and support requirements can be modeled using various types of pattern and spot bolting and shotcrete. Use UnWedge to quickly create a model, perform a safety factor analysis, place reinforcement and interpret the results. The graphical data interpreter provides a rich set of tools, including 3D animation, for the convenient display of wedges surrounding the excavation. The most prominent feature of UnWedge 4.0 is its probabilistic analysis capability. Probabilistic analysis can be used to add statistical distributions to variables such as joint orientation, joint strength, support properties, as well as field stress properties. UnWedge v4.0 gives the user the ability to add and edit a ground surface to the excavation cross-section. The ground surface can be drawn within UnWedge or it can be imported as a DXF. UnWedge v4.0 expands on DXF importing by allowing the user to define the import as either an opening section, a ground surface, or a polygon or polyline tool. 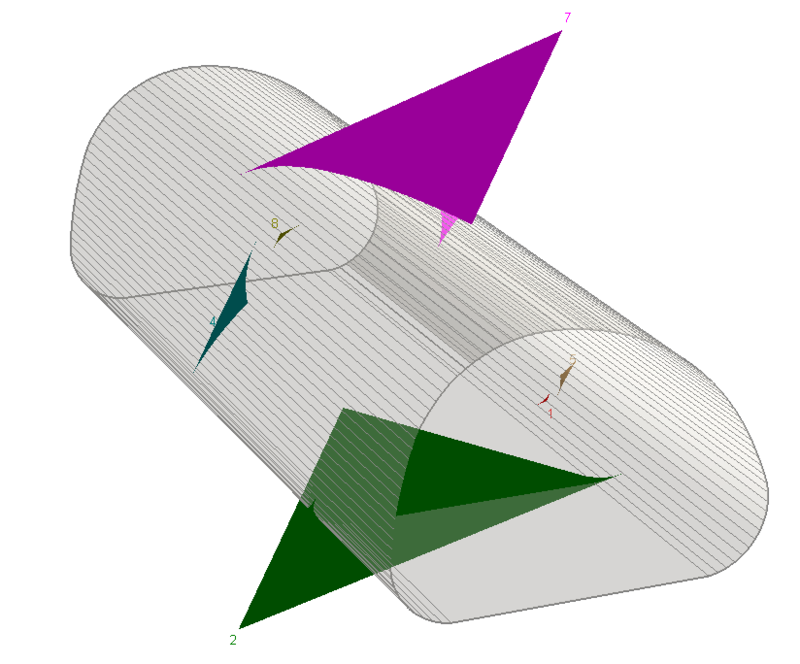 Polygon and polyline tools can be used as guides for drawing geometry within UnWedge. The user can also import properties from other UnWedge models. UnWedge v4.0 has incorporated a failure mode filter, which is used to filter wedges by mode of failure. This option is available in both deterministic and probabilistic analyses. 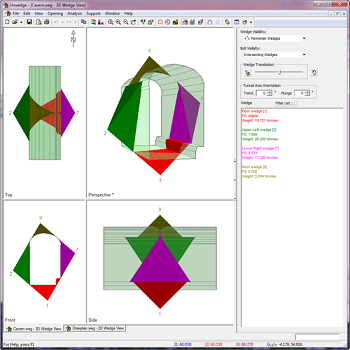 UnWedge v4.0 includes four Eurocode 7 design standards for use in the program. The user can import or export their own design standards, or add Eurocode 7-based design standards. 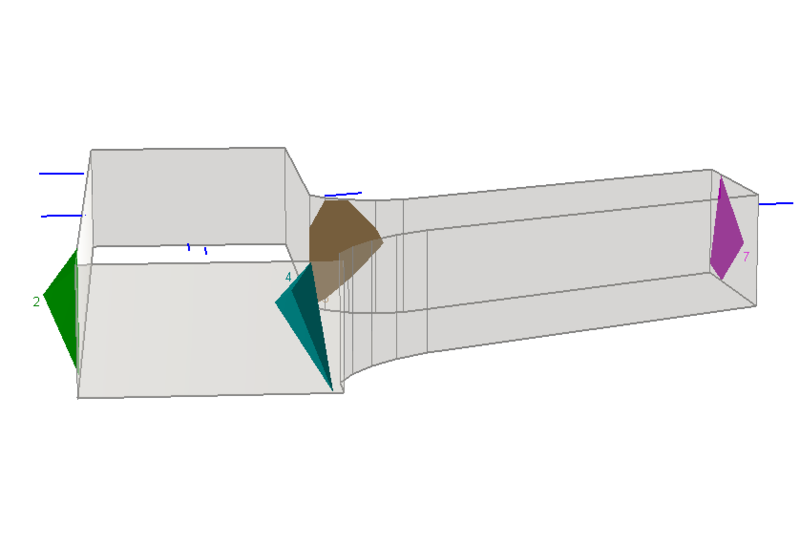 UnWedge v4.0 allows the user to select a joint structure continuity. The continuity can be defined as infinite, persistence, or trace length. 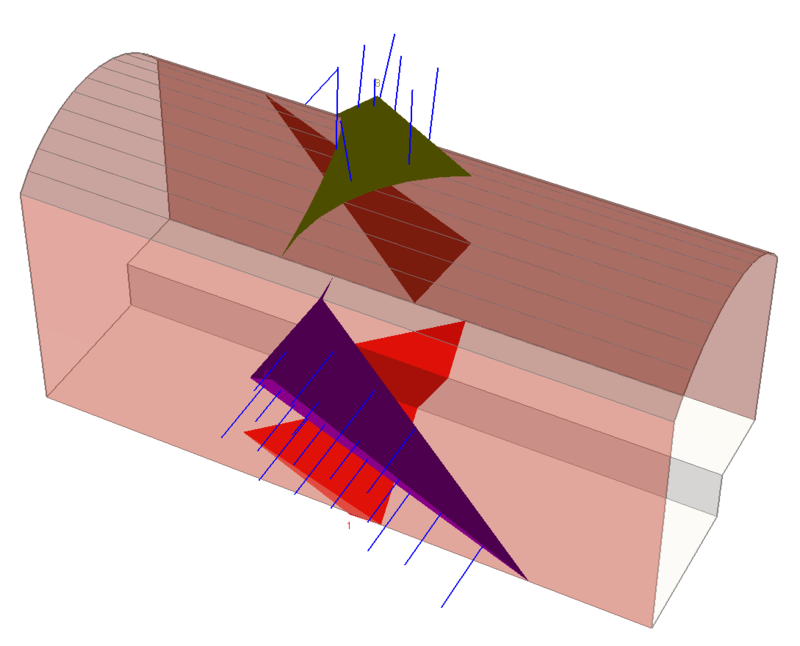 Using block theory, UnWedge determines all possible wedges that can be formed by the intersection of three joint planes and the excavation. The method used for finding the wedges is described in the text by Goodman and Shi (1985), “Block Theory and Its Application to Rock Engineering”. UnWedge always determines the wedges that can form around the perimeter of the excavation. A maximum of six wedges can be formed around the perimeter. Less than six wedges may be formed, depending on the joint orientations and the shape and orientation of the excavation. UnWedge also finds the wedges that can be formed at both “ends” of the excavation. If the Opening Section represents the plan view of a horizontal excavation, then the End Wedges will be the roof and floor wedges. The most prominent feature of UnWedge is its probabilistic analysis capability. The probabilistic analysis can be used to add statistical distributions to variables such as joint orientation, joint strength, support properties, as well as field stress properties. Either pseudo-random number generation or random number generation can be used in the analysis. The pseudorandom generation uses a constant seed value (with the option of specifying the seed), whereas the random generation uses a variable seed value based on current time. The probabilistic analysis also gives the user a choice between two sampling methods: Latin Hypercube and Monte Carlo. A computation runs a specified number of trials to determine significant data, such as Maximum Wedge Depth, Factor of Safety, and Maximum Support Pressure. The data can be analysed in the new Probability View allowing the user to plot histograms, cumulative plots, and scatter plots of the data. Specific trials and specific segments of the cross-section can also be plotted with a simple right-click function. For wedges that require support to achieve an acceptable safety factor, three different methods of modeling support are available in UnWedge: bolts, shotcrete and pressure. Bolts - either pattern or spot bolts can be applied, and several commonly used bolt types are explicitly modeled (e.g. anchored, grouted dowel, cable bolt, etc). Multiple bolt patterns can be applied on the perimeter. Shotcrete - one or more layers of shotcrete can be applied anywhere on the excavation boundary. The shotcrete layers have user-defined thickness and strength. Pressure - support can also be modeled as a uniform pressure, applied anywhere on the boundary. The pressure option can be used to simulate the equivalent applied load of any type of support system. Any or all of these support types can be applied to a given model, in any combination. The Tunnel Axis Plot option allows you to automatically vary the Tunnel Axis Orientation over a range of values and generate a plot of the results. This allows you to examine the relationship between Tunnel Axis Orientation and output parameters (e.g. Required Support Pressure, Maximum Wedge Volume, Minimum Factor of Safety, etc.) and quickly determine the most critical tunnel orientation(s) with respect to any output variable. If your project has the flexibility to vary the Tunnel Axis Orientation or if the Tunnel Axis Orientation varies continuously (e.g. 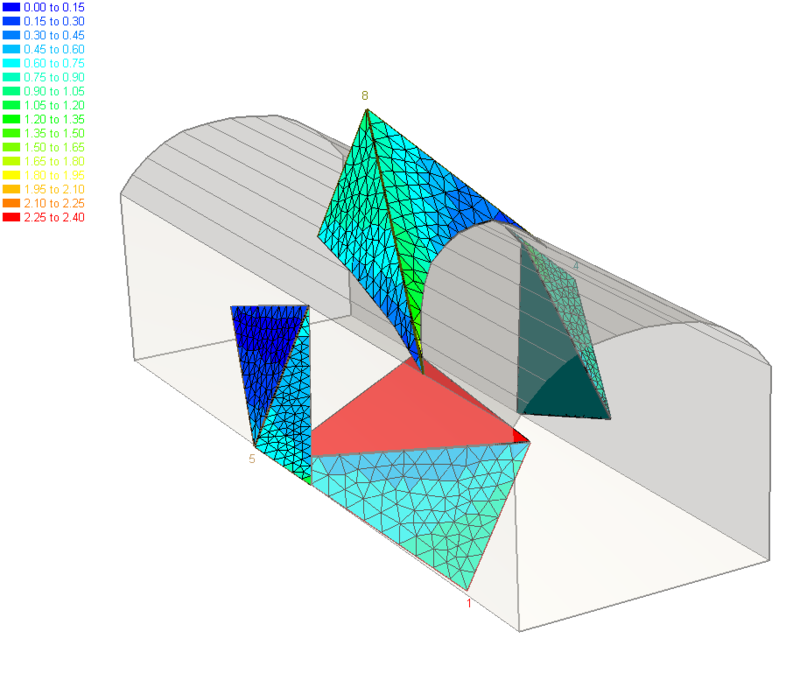 a curved tunnel or a spiral ramp), then the Tunnel Axis Plot can be a very useful tool. 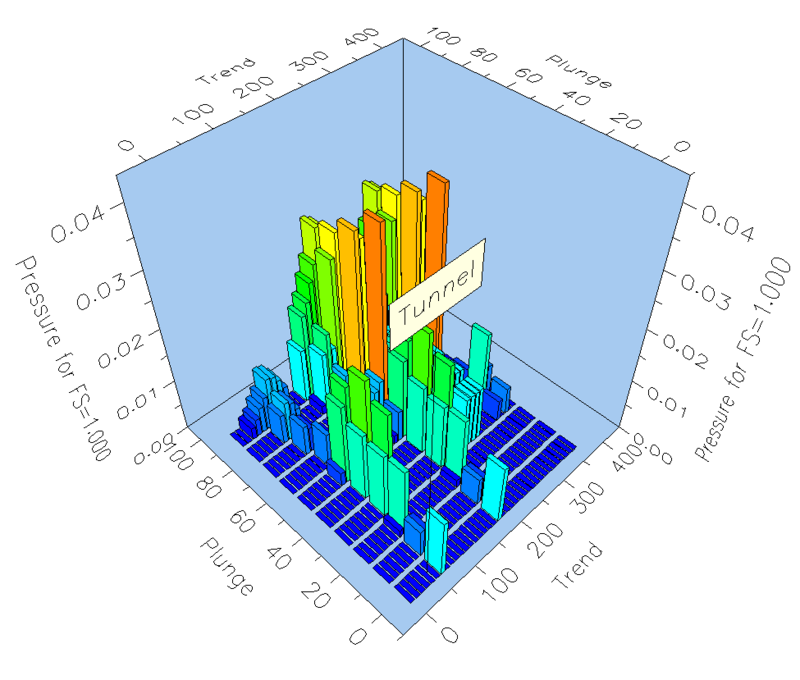 Three types of tunnel axis plots can be created: Contour Plot, 3D Chart or 2D Chart. See the latest software updates and download the newest version.